This Nature review by Dr Steve Rintoul evaluates the published research on Southern Ocean change: including changes in circulation, stronger winds, and increased freshwater input. The Southern Ocean exerts a disproportionate and profound influence on global ocean currents, climate, biogeochemical cycles, and sea level rise. The paper shows that substantial progress has been made in recent years in understanding the dynamics and global influence of the Southern Ocean. It is becoming clear that local scale processes play a fundamental part in shaping large-scale circulation. This is driven by the local topography which, of course, doesn’t change to a significant degree. Read the full article at this link. 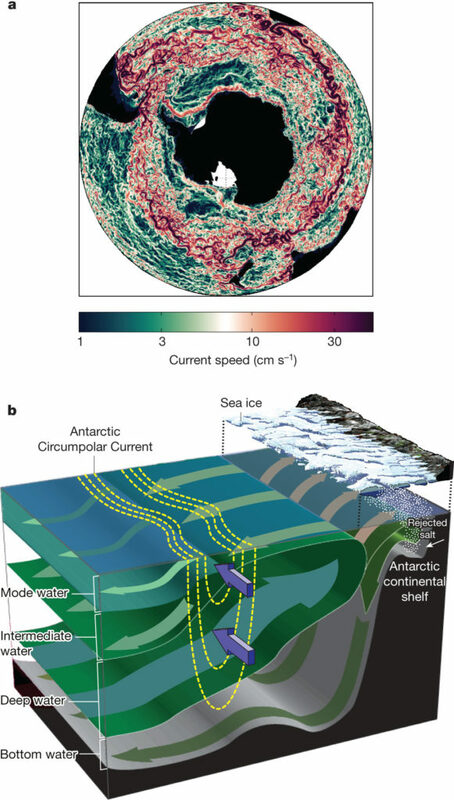 Figure: The Southern Ocean circulation. a) Five-day-mean current speed at a depth of 112m from a high-resolution (1/12°) numerical simulation of the ACC, illustrating the filamented, eddy-rich structure of the current. Image adapted from Patara et al., 2016. b) A highly schematic illustration of the Southern Ocean overturning circulation. Deep water spreads polewards and upwards across the ACC. Water that upwells close to Antarctica is converted to denser bottom water by cooling and brine released during sea-ice formation (indicated by white dots in the upper right of the diagram). Water that upwells further north is converted to lighter mode and intermediate waters that sink to the north of the current and ventilate the intermediate depths of the ocean. The schematic omits many important aspects of the Southern Ocean circulation, including wind and buoyancy forcing, eddies and mixing processes. Image adapted from Rintoul, 2000.